Can anyone give me a decent appraisal for this 'black beauty' vintage axe which was made in 1982/83 . It was based on a '57 Les Paul. 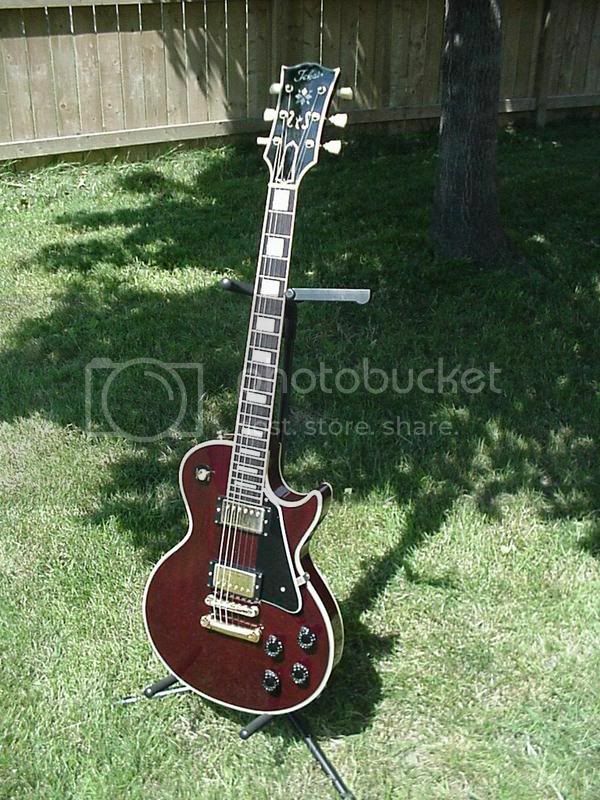 I don't have the ?3000+ for a Gibson so any info is much appreciated. I've just joined the TR and this is my first question so I'm relying on any opinions. Is it something you are thinking of buying? Then you should post a link to the auction so we could see some pics and the price etc. Anyway it's nearly impossible to say anything without seeing any pics of the git so please try to find a way to post some here. Wellcome to the forum. I am glad to find informations about this guitar !!!! I own a Tokai LC 3 pickups with flower inlay on the head ( like the gibson artisan). This guitar appears on 1982 tokai catalog . I will post some pics very soon . Is this one with a split/diamond headstock in 82/83? Or flowers? Here are the original pickups of my guitar (1982 LC110 BB). Does anybody have any information about them ? (Goto and a "S" stamped on the back ). The last owner of the guitar putted Epiphone 57 PAF instead of these ...Should I put the Gotoh's ? My 82' LC (100 I believe), 2 pickup model, has the floral headstock inlay. Luv it! Custo, that?s the same pickups coming with LS-80 Reborns,see back and you?ll notice not bein an accurate PAF replica.They are around 8,30 K a bit hot for a neck pickup in a Les Paul.My guess is Tokai put 2 similar pickups regarding readings not as they do now (MK-II). LC-110 are pretty rare beasts. Esentially an LC-100 with a middle pickup, they feature all mahogany body, mahogany neck w 18d pitch and 2 pce mahogany top instead of maple. They also have an ebony fingerboard - not a blackened rosewood board used on the LC-60 and LC-60M. The head inlay varied from year to year also, and re-issues do not have the same truss rod cover and head inlay as the 1980 - 1984 years. They were not built after 1985. I bought it 320? (440$). I have issues finding a pickguard. Any clues ? Seriously though, the old Tokai customs are great. For a pickguard why not just get one for a 2-pickup custom and cut off the section in the middle? Well I don't know if it's korean or japanese. I found it on a garage sale 6 years ago. Looks Japanese to me. The real shell inlays are hard to miss.